If you walk down the Ringstraße along the Houses of Parliament, the University, the Votivkirche Church and finally the Wiener Börse Stock Exchange, you will eventually get to a seriously odd sight: A red-brick building that resembles Tudor courts such as Hampton Court Palace in London or St. John′s College in Cambridge. Step back and clap yourself on the shoulder: You have made it to the very end of the Ringstraße, as one of very few tourists that do. The building you are looking at is the Roßauer Kaserne, a former army base. In the course of the revolution in 1848, the authorities realised that the city centre of Vienna was vulnerable to revolts and open fighting. In order to ensure the control of potentially rebellious proletarians, Emperor Franz Joseph I got his advisors to work out a concept to build army bases and police stations all around the Innere Stadt centre of Vienna. The core sites of this concept were the Arsenal (where the Army History Museum is) in the third district, from where artillery could have fired shells on the old town; the Franz-Joseph-Kaserne Base; and the Roßauer Kaserne Base. You can tell that the Roßauer Kaserne was built for defensive and suppression purposes by the look of it: Based on designs by the military officers Karl Pilhal and Karl Markl, the building has three courts, mighty walls and castellated towers. Such a design was totally unsuitable for conventional warfare in the late 19th century - but highly efficient for fighting untrained rioters and revolutionaries. 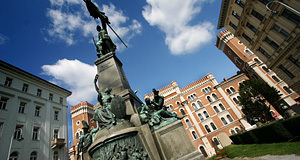 The Roßauer Kaserne was opened in 1870, which makes it one of the later Ringstraßen buildings. It offered space for up to 4,000 men and 390 horses. According to legend, the architect forgot to consider the construction of toilets and once he discovered his mistake, was so ashamed that he committed suicide. In fact, there were toilets in the Roßauer Kaserne from the very beginning, but only in the towers of the two outer courtyards. Therefore, additional toilets had to be built at a later stage, which caused significant costs and trouble. During World War I, it was used as a distribution camp for prisoners of war. At the end of the war, nobody quite knew what to do with the building. It was used as a homeless shelter and a museum, later the stables were transformed into garages. During World War II, the Roßauer Kaserne was hit by a bomb and seriously damaged. Due to this damaged and increasing decay, the Austrian authorities attempted to demolish the building in 1977. Due to the historical significance of the ruin, however, it was decided to refurbish the base. After this refurbishment had successfully taken place, various parts of the federal and provincial police administration moved in. In 1989, some branches of the Ministry of Defence moved in. The court occupied by the latter was named "Carl-Szokoll-Hof" in an attempt to commemorate a resistance man fighting the Nazis. The Roßauer Kaserne is interesting to look at from the outside, but not open to the public.